At a time when the power of information technology doubles every 12 to 15 months and extends to capture every scrap we have, digitizing biodiversity information is a final frontier for IT. It's an essential step to ensure society maintains and hopefully increases bio-literacy. Toward this end, there's Antweb. It's a project from the California Academy of Sciences that has incorporated the Google Earth interface to provide location-based access to the diversity and wonder of ants: from your backyard to the Congo Basin. As society advances, literacy increases and bio-literacy decreases. If you're illiterate, you may view a library as thinly sliced stacks of firewood; a Google search engine is meaningless. If you are bio-illiterate, a forest is at best a green blob to be consumed. If you are bio-literate, you see the diversity of the forest and understand that each animal, each plant, tells a story and has a place. Google has helped us achieve free and democratic access to information, but now, with Google Earth, it's taken an important step to promote bio-literacy. Together with other institutions in the Bay Area, Google is uniquely poised to take on this enormous task. There are two ways people need to access information on biodiversity: either have a name for which they want more information, or they are at a location and want to know what they will find there. On Antweb, you can access information about ants via location – and Google Earth allows for any scale of access via location. So you can be in Santa Clara County and see what ants you are likely to find. Soon you will be able to create a field guide for ants in any location defined in Google Earth. We tried to get NASA’s help to develop such a system for years with their mapping expertise and data, but Google Earth answered the call first. 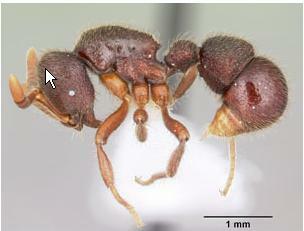 I am so impressed with Google that I have named an ant I recently discovered in Madagascar Proceratium google. Its bizarrely-shaped abdomen is an adaptation for hunting down obscure prey: spider eggs. Here's what it looks like. I hope that Google will continue applying its skills to serve biodiversity data to conservation planners and the general public. Google has given us a tool to connect the 6 billion people on earth with our remaining biodiversity. Antweb welcomes any form of collaboration to help achieve this goal – and may the ants be with you.